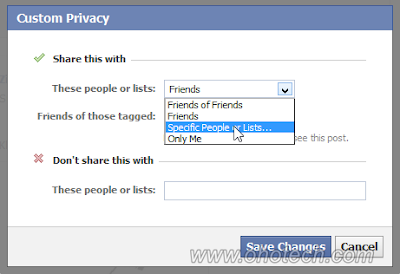 Did you ever find your self in situation in which you just want to share your facebook status with some people only not with every one so in that case facebook privacy comes in play.Facebook privacy is great thing like how to hide your facebook friend list from public that i shown you last time now i will show you how to hide your facebook status from public,with some people or you can say make your facebook status to appear only for some people.So let see how to do this. 1.) Type your facebook status then click on small arrow besides post button seen below image ,so if you want to share status with public click on public else you choose other option as i want to share my facebook status with only one people i am choosing custom type. 2. 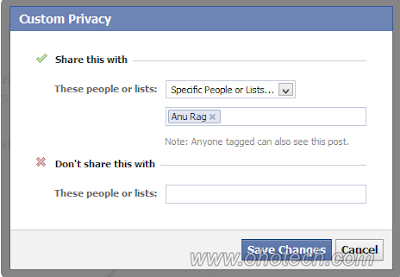 )Now in custom type choose whether you want share your facebook status with some people or you just want to share every one except some people the choice is all yours as per your needs ,see below image i want to share my status with only a specific one person so i am choosing with specific people or list. 3. )Now choose your list or enter the name of people whom with you want to share as i enter my friend name and then finally click on Save changes. Your facebook status will be share with some specific people or else your facebook status will be remain hidden from many people.